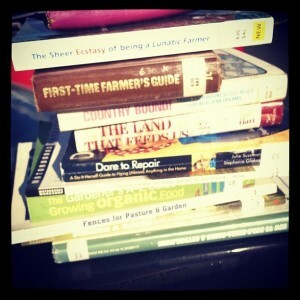 On Wednesday, after Dad and I had put an offer on the farm, we stopped at our local library. For a rural library, we were both disappointed by the limited number of homesteading books available; perhaps this is a result of living on the East Coast where people don’t really think of homesteading much anymore. Or perhaps the issue was that while being a rural county it isn’t really an agricultural county in any grand way. Or maybe it’s simply that most of the patrons haven’t expressed any interest in this subject. I’m not sure, but in any case, we took what we could find. I did manage to get a few books on caring for old houses and a couple on farming, including Joel Salatin’s The Ecstacy of the Lunatic Farmer, which I started right away. I’ve read the same few pages on “Growing Soil” several times because I get a bit lost in the conversation; I take that as a good sign though – I’m learning something new, and it takes me a bit to fit it into what I already know. Salatin is inspiring reading for sure, although I do tire a bit of his rhetoric about ill-informed and backwards most other farmers are. I’d rather just hear about what he does, but maybe he has to show the weaknesses in others’ practices to make space for his own. I also picked up The Gardener’s A-Z Guide to Growing Organic Food, Dare to Repair: A Do-It-Herself Guide to Fixing (Almost) Anything in the Home, The Land That Feeds Us by John Fraser Hunt, First-Time Farmer’s Guide, and a few other titles including one on how to create good fencing. As always, books are the way I am beginning this new endeavor. I read when I got married and then when I got divorced. I read when I started teaching full-time and when I decided to leave full-time teaching. I read when I was dating an alcoholic and when I decided to leave. I read when my mom was sick and when she died. I hope this time all this reading is part of a beginning that will continue until the day I end, not before. What about you? Do books factor into your life adventures? Do you pick up books when you travel, when your family changes, when you hit a razor-sharp patch in life? How do they help you? Hurt you?